I am the world’s lousiest recipe name giver. When I think about food there is always a fantastical backdrop, the stage is littered with metaphor and simile, and sometimes reckless exaggeration trips the actors up (although they don’t mind). The colors are vibrant or soft, the textures play tricks on my tongue, the smells bring me backwards or forwards in time, and the flavours…they make me see stars, and other worlds, and limitless possibilities, and sometimes if I’m lucky, a bright green fairy that grants three wishes. This is what’s in my heads and under my skin when I think of food. When I write this all down and have it sorted into a recipe, the fanfare suddenly quiets. I have successfully captured all the essentials to be able to repeat the experience, but none of the tra-la-la is left for the recipe’s name. Which is why it reads like a list of ingredients instead of something more exciting. I guess I just don’t like titles. – Form the risotto into a patty. I like to pack it into the measuring cup as it comes out formed into a nice uniform shape that I just have to flatten a bit. Coat this all over in the breadcrumbs. Keep it in the fridge until you are ready to fry it. – Prepare your pesto. I use my basic recipe for basil pesto, substituting the pili nuts for pine nuts and almonds. In truth, I just stick (more or less) to the quantities and use any herb/nut combination I want, many times using the pesto as a final resting place for little bits of nuts and herbs! Store in a jar (tightly covered and in the fridge) with a thin film of olive oil to cover the top surface of the pesto. – Bring a saucepan of water, with a small glug of vinegar, to a rapid simmer. – While you are waiting for your water to simmer, heat oil in a skillet. Once oil is hot lay risotto patty in the pan and fry until the bottom is golden. Flip patty and fry until the other side is golden and has developed a nice crust. Set aside. – When the water in the saucepan has reached a rapid simmer, it’s time to poach your egg. Say a prayer (this is how I poach eggs). Crack the egg into a small bowl. With a wooden spoon make a little whirlpool in the water. Now gently (gently!) slip egg into the center of the whirlpool. Don’t freak out as alien strings of egg white churn wildly in the water. I’ll keep my egg in there for about 2 minutes (you can keep it in for more – whites should be firm and yolks done to your liking). Turn off the heat and gently (gently!) pick up egg with a slotted spoon. Brush off alien egg white strings and pat excess water off with a paper towel (Sorry Earth!). – Arrange prosciutto slices on risotto patty. 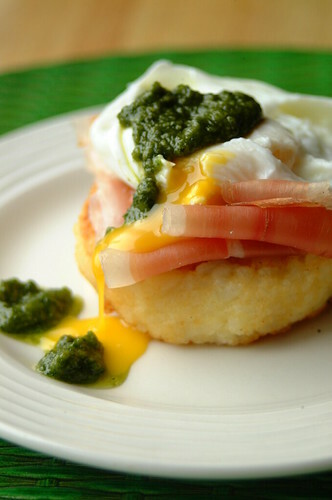 Top with egg and pesto. These are the quantities that will serve one – you can multiply it all you want to make a breakfast for two or a brunch for 12. Despite my longish explanations above (I just wanted to be thorough), it is very simple to make and can easily be put together in the morning. You can shape and coat the risotto patty the night before and the pesto can be prepared in advance as well. Suffice to say I have an inordinate amount of leftover risotto lying around so I will be making more of these patties. They are a bit simpler to prepare and cook than arancini (which is another reason why I dare not call them so) and can be served with many things. Try them as a side for meat or fish…or make smaller patties and place them in a salad. I think mini-patties topped with a smidgen of pesto or salsa verde would make a great appetizer. 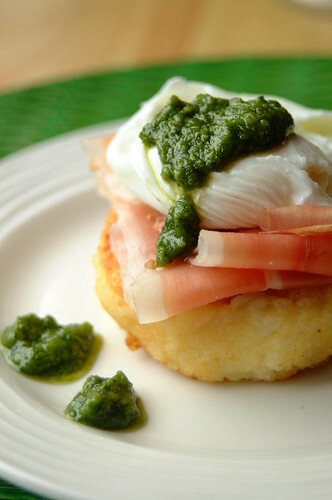 Italian green eggs and ham!